Lifter valley posts and VLOM? Cam bearings? Don't recall with GMT900. But have seen them go from 1 speed transfer case to 2-speed unit. Read some posts a long time ago over at Performance Trucks forum about GMT800 doing such though. Not sure of wiring, would have to pour over shop manual wiring diagram and see what modules need programming. Nice work Jack! Keep a close tabs on maintaining that pillow block, that's your weak link but easily replaced. Where in Florida are you? Looks like any number of neighborhoods I've lived in over the years! The factory tables for running E85/FlexFuel are already in the computer. They are plenty robust for performance but can be tweaked for even more horsepower and efficiency through custom tuning of those tables. Make sense now? My truck calculates the alcohol content differently than you guys. E85 can lawfully be anywhere from 51% to 83% alcohol. Winter Blend for most places is 70% to allow for easier starting in cold weather. I've been running E30 and have been getting even better tank averages with this stuff than on gasoline while saving nearly ten cents a mile in cost. E30 is not supposed to drop lower than 25% but my supplier is usually pumping out 20-26% but the latest is 16% and it behaves little different than gasoline. Most of the time when running pure E85 it is in the 72%-76% range but peak performance and the lowest mpg comes with 80%. But, my particular Gen IV LC9 5.3 makes more power in the low 20s it seems and gets better gas mileage and right now it's so much less costly to run! Running 93 gasoline (BlackBear tuned) my cost per mile averages almost a quarter a mile, $.24 cents! Running E30 my cost per mile averages but sixteen cents a mile, $.16! That's a lot of money folks and free horsepower to boot. Free horsepower is fun! Truck runs great on all but the lowest % of ethanol, below 20% it feels little different than gasoline. 20-23% offers best performance and city mpg greater than gasoline with alcohol 8-18% because the motor is making more power. Highest alcohol content on E85 I've seen is 80%. Usually it's between 72-76%. Neat stuff right? You could always convert from AWD to 4WD, transfer case, front differential, Dash knobs and programming and voila! There were more than a few 6.2 4WD Tahoes (2009) and a few 6.2 4WD Yukon XLs (2010) built and you can replicate that. When a code sets, the computer stores a freeze frame of the various sensors at the time the code set so you can compare these against the shop manual. You need a bi-directional tool to see this like the Tech-2. If a smoke test was done and there is no leak, the next likely suspect would be the ECM but the troubleshooting guide should be followed in the factory shop manual and not my guessin'! A friend of mine had a Duramax 4x4 with Toyo highway tires on it. Going down a trail, he had to engage his 4WD while I could stay in 2WD as my tires are KO2s. The front differential is open and does not lock up or have posi/limited slip. Pressing the Traction Control button turns just that feature off. But hold it down for 5 seconds and both TCS and StabiliTrak systems are turned off. 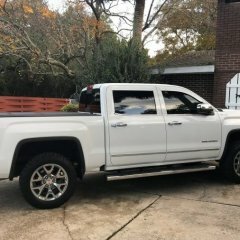 A fella who just bought an AWD Denali had the same issues as you in the snow over on the Tahoe Yukon forum but I forget the outcome of his woes. AWD is great in those trucks. Never heard of Blacklion tires before. AWD Denali is not a 4x4 Ram and not going to behave like one. It'll be better in many respects and worse in others. First thing I'd do if in your shoes is compare those tires against the industry leaders. Have you done a smoke test? Gotta do that to check the lines and fittings from front to back and especially around the fuel tank. The 4.8 is not an LM7. The LM7s camshaft is smaller than the one in the LC9. If you want the stock cam without the AFM mods, use the Gen III L33 camshaft. About the only parts you'll use are the sprocket and timing chain and tensioner but they're cheap enough to buy new. The LC9 has a much better oil pump too, don't get misled into swapping for the LM7s either. The sunroof adds weight to the vehicle. The weight of your vehicle's options gets added to the curb weight. Subtract the curb weight from the GVWR and you have your payload capacity. I guess that could happen if the pressure fell off while engage in V4. I would think that they put in another fail safe to protect against that and didn't feel the need to share it with us. As for the oil, I was thinking about the specs, the ASTMs D445, D2270, D4683/D4741, etc. I'd like to use those numbers and any others you might suggest to compare a new ACDelco oil, Shell's Rotella Gas Truck and Quaker State's Ultimate Durability in 5W-30. Oh, and Redline too.